Introduction to critical thinking, mathematics, and problem solving. 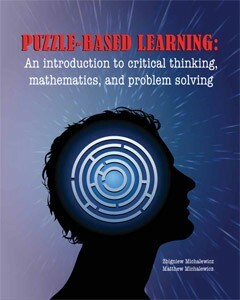 Puzzles are educational, but they illustrate useful (and powerful) problem-solving rules in a very entertaining way. Puzzles are engaging and thought-provoking. Contrary to many textbook problems, puzzles are not attached to any chapter (as is the case with real-world problems). It is possible to talk about different techniques (e.g., simulation, optimization), disciplines (e.g. probability, statistics), or application areas (e.g. scheduling, finance) and illustrate their significance by discussing a few simple puzzles. At the same time, the students are aware that many conclusions are applicable to the broader context of solving real-world problems. We have organized this book in the following way: We begin with the Introduction (what a nice section to start with! ), which explains in more detail the motivation behind this text. This is followed by thirteen chapters that are grouped into three parts. Part I presents the first three chapters, each of which discusses a simple problem-solving rule. Needless to say, each rule is illustrated by a collection of the best puzzles we could find. Part II presents eight chapters, from 4 to 11. These chapters cover various aspects of problems and problem solving by discussing constraints, optimization, probability, statistics, simulations, pattern recognition, and strategy. This part of the text makes a clear connection between various puzzles and different branches of science. It also includes a discussion on many mathematical problem-solving principles. Part III, on the other hand, consists of just two chapters that can be used as assignments (a collection of puzzles with and without solutions, respectively). These chapters include many puzzles that illustrate the applicability of various problem-solving rules and mathematical principles in a variety of domains.